"Who want's to be a Millionaire?" 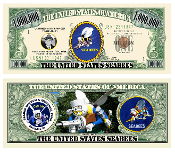 With these great looking novelty Seabee Bills you can be as rich as you want in thanks for the "Can Do" Seabees. The highly detailed bills are printed on fine paper to give the feel of actual money. You will be amazed at all the facts on this dollar bill sized masterpiece. The front features Frank Iafrate's original 1942 logo and a picture of Admiral Ben Moreel, CEC, USN, the father of the Seabees. Turn it over to see a vivid detailed image of the famous Davisville "Gate Bee" in full color. At this price, buy several. They are the perfect gift to someone who asks: "What are the Seabees?"